Even though Brontë isn’t in preschool yet, she is never lonely. Out of a ridiculous number of dolls and stuffed animals, she has selected three best friends: Pink Bear, Yellow Bunny, and Minnie. 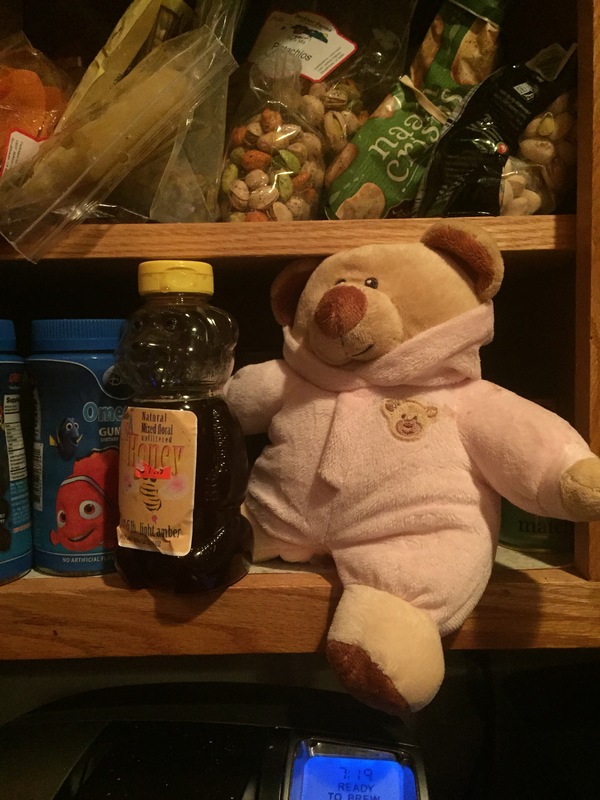 Pink Bear is a little bear that wears a pink hoodie. She selected him from Nugget’s flower shop one day and they have been buddies ever since. He’s cute, but given to lots of mischief behind the scenes. He jumps on her bed, throws her books off the bookshelf when no one is looking, and sneaks honey whenever he gets the chance (because, as we all know, bears like honey). Pink Bear gets into trouble but is still lovable. I think he makes Brontë feel better about her own mischievous tendencies. 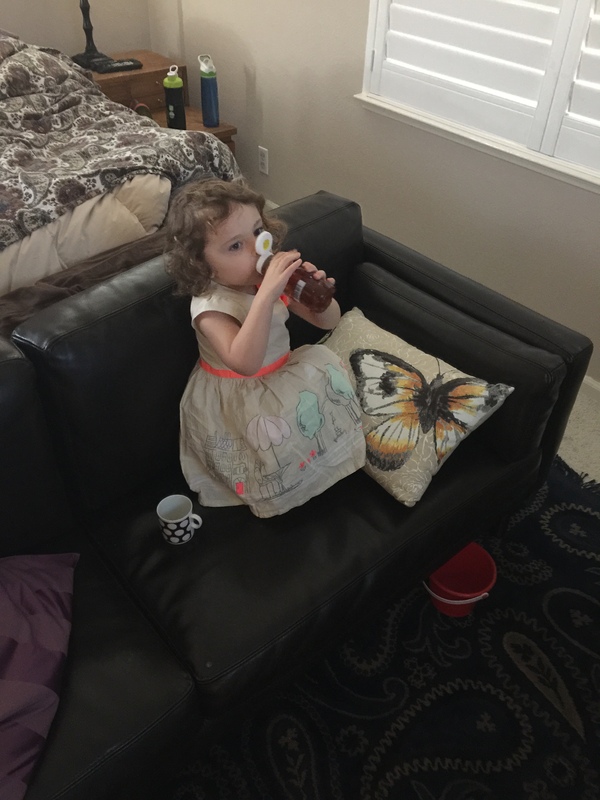 Yep, caught drinking honey straight out of the bottle. 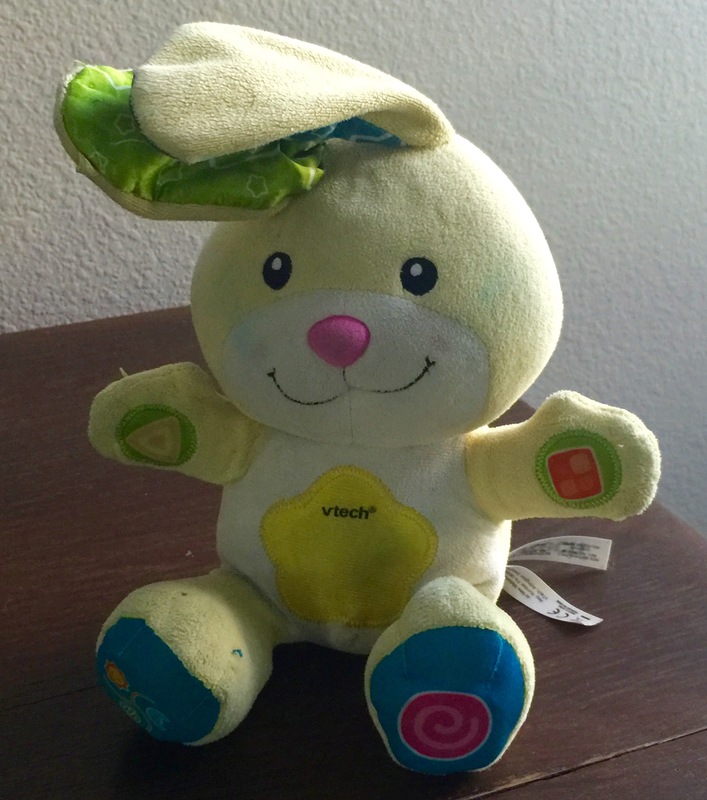 Yellow Bunny is Pink Bear’s quieter friend. He occasionally argues with Pink Bear, but is usually his calm sidekick. Still, he has been elected to Brontë’s inner circle, mostly because she flat out loves bunnies. They have two long fuzzy ears with which she can drag them around and which she also likes to rub under her nose. It’s a bunny. And he’s yellow. 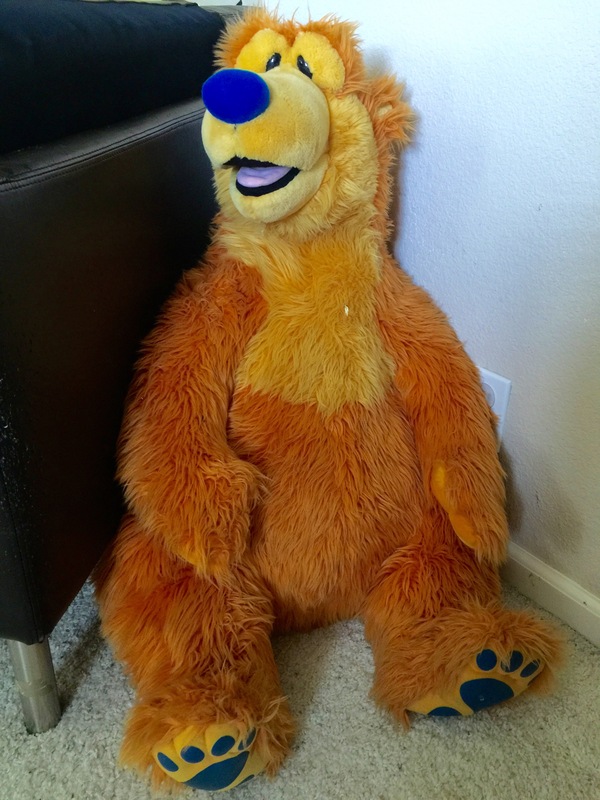 Orange Bear is a giant orange bear with a blue nose that used to live in Brontë’s room. He was once a close friend, but fell out of favor. One evening, during her monster episodes (when Brontë was convinced monsters were menacing her room), I told Brontë not to be afraid because: 1) there aren’t any monsters. I checked, and 2) if there were monsters, Orange Bear would protect her from them. I pointed out that Orange Bear is very big and could take care of any monsters, should they happen to sneak in. She seemed reassured by this idea. “Orange Bear protects you from monsters,” I argued. “NOOOOOOOOOO!,” she yelled, “He LET MONSTERS IN.” She stomped back into her room and slammed the door. Monster double agent and all-around traitorous bear. Hmm. Well, I can understand why she was so pissed off with him. He’s supposed to be her friend and gives her this whole song and dance about protecting her from monsters, then late at night she saw him letting them inside her room? What a douche. We moved Orange Bear into Bridget’s room because Brontë absolutely would not have him back, and luckily, he and Bridget seem to make better roommates. Minnie, on the other hand, is Brontë’s absolute BFF. Pink Bear and Yellow Bunny are fun, but Minnie is undoubtedly the favorite. She is chief counselor and vice-president reigning supreme over all other toys in Brontë’s play world. 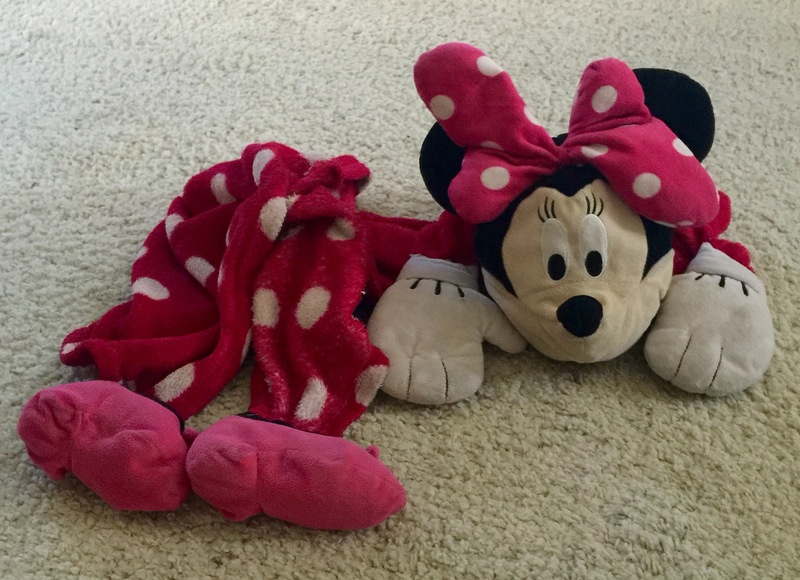 Minnie is a Minnie Mouse puppet blanket that Brontë likes to throw around her neck and drag along, wherever she goes. Minnie always cuddles Brontë when she goes to sleep. Brontë often tries to shove the Minnie puppet on my hand so I will talk for Minnie, yet my daughter seems to accept Minnie as a distinct personality despite her awareness that she’s frequently powered by my hand. Nonetheless, Minnie is completely out of control. She may speak with a cutesy mouse voice, but she’s moody, throws fits, and often tries to chew on Brontë’s hands. She mocks Brontë and Brontë mocks her right back. Sometimes Minnie does incredibly inappropriate things like grab pencils and draw pictures of poop on notepads, yell at Brontë for being loud when she’s “trying to sleep,” or take over story time and repeatedly attempt to eat Brontë’s books. I think Brontë not only can identify with Minnie’s wild impulses, but she also likes to be the one saying “No!” For once, Brontë gets to bark the orders, enforce house rules, and tell Minnie Mouse to settle down. Minnie has been a surprisingly useful training tool. For example, we had a problem for several months with Brontë’s behavior when we picked her up from grandma and grandpa’s house. Brontë wouldn’t look at me for hours, would throw nasty screaming fits, refuse hugs and all conversation, and would generally act up well into the next day. This would happen again and again, until John and I were at our wits’ end trying to figure out how to handle the situation. We weren’t sure if Brontë just didn’t want to leave her grandparents’ house, where she never gets in trouble and popsicles flow like running water, or if she was incredibly angry at me for leaving her. It was probably a bit of both, but I was tired of dealing with two days of constant tantrums for whenever Brontë stayed with her grandparents and every approach to calm her down was an utter failure. Finally, one night we were going home after picking the girls up from their grandparents and Brontë, as usual, was pouting, whining, and averting her eyes whenever I looked at her. I called her into her room to go to bed, as Brontë stomped around behind me, where Minnie was throwing a massive fit. Brontë stared, wide-eyed… “I’M MAD! I’M MAD AT YOU!” Minnie said, then started rolling back and forth, yelling and screaming and kicking her little high-heeled mouse feet. Brontë’s eyes bugged out for a second before she started to giggle. Then Minnie got right in Brontë’s face, opened her big muppet mouth, and started yelling, shaking her head back and forth. Brontë broke into hysterics, laughing so hard that her eyes started watering. Very popular, despite her rockstar antics. “I MISSED YOU! YOU LEFT ME! YOU WERE GONE, GONE, GONE AND I DIDN’T KNOW WHEN YOU WOULD COME BACK!” Minnie screamed. “Aww,” Brontë murmured sympathetically, a real look concern in her eyes. “I”m back!” she said, and gave Minnie a big hug. She pet Minnie’s head sweetly and said, “I missed you too.” They cuddled up and went to bed. “I missed you too! I’m back!” I reassured her. I gave her a giant hug and she squeezed me back before grabbing my hand in her little fist. No tantrums that night. Minnie continues her ridiculous antics from time to time, but she has proven herself a valuable ally in Brontë’s coterie. She can talk to her about stuff that’s too scary to tell mom. And Minnie always understands.